The inside of the home's not done yet, so let's just completely avoid looking at that pile of trim nestled up against the wall on the dining room floor for now, and set our sights outdoors, shall we? The rest of the fence is going up, and we're still having a load of trouble figuring out the gate... but thanks to a good friend and a very healthy (and abundant) garden, we've now got more day lillies than I know what to do with, as well as columbine, autumn clematis, sweet woodruff, irises, evening primrose, hostas, and that's not including the sunflowers, zinnias, asters and marigolds we've started by seed. We've also got 3 rows of heirloom arugula sprouting, 2 rows of mesclun mix, three bok choy heads, and a row of snow peas growing on the fence. I've got basil, chives, italian parsley and cilantro growing inside in the mini-greenhouse, but DH won't let me put the basil in the ground for at LEAST another week. Oh, and on PBS I watched a show about growing orchids... outside in your garden. 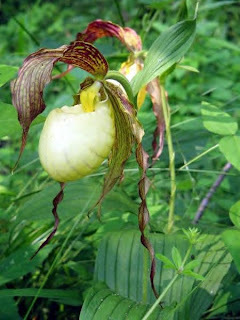 Apparently quite a few orchids are native to Kentucky, including this Kentucky Ladies Slipper Orchid. 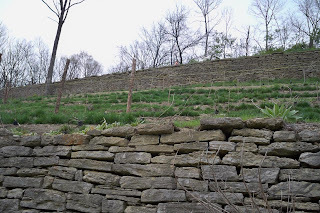 Just a quick video of the Monte Cassino Vineyard in Covington, KY one year after the vines are planted, the deer fences are in place and the lower hillside just cleared. It was muddy, but very impressive. As much as I'd love to call this place our own, it belongs to DH's sister and husband. Long live the Dornfelder vine! Long live the Schmidts! This vid hardly does the scale justice. 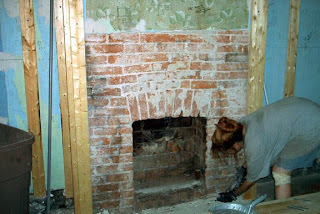 These walls are MASSIVE and they've been there, dry stacked, for over a hundred years. The shot is taken about 95% of the way up the hill too. Turning around gives a huge panorama of the river valley. 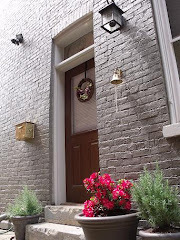 If you came here from Julia's Hooked on Houses Blog Party, here's your link back. And of course, to do it in any normal, stable manner would just be out of the question. 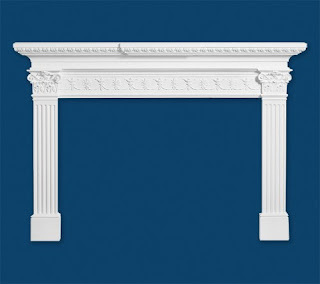 No, I wanted columns and go-gahs, but to buy all that trim and put it together like normal people have done for decades? No, not me. I went to the Covington Reuse Center (the place we got all of our closet doors) and bought some weird exterior foam trim stuff that I'd been eyeing for months. I know that the original purpose of this stuff is that you somehow slap it on the outside of one of these new "I can build you a new home in 7 days or less" monstrosities and it's supposed to look all castle-y. This is either going to be very cool, or really really stupid. I'm taking pictures. I'm just hoping I didn't waste $100. Time... and bondo... will tell. A lot of folks rant against the Big Box Stores, and there are shortcomings to a major corporate approach to hardware and building materials. That said, in the past year and almost 5 months, we've gotten a good deal of personal help, attention, and support. We've come to know a number of folks by first name at the old Crescent Springs Home Depot and they seem to want to go out of their way to help us. By help, I don't mean "you can find it in aisle 13". I mean expertise. I mean patiently figuring out what you want to do and then sharing what they know or simply ideating and problem solving with you. It helps when someone has done a lot of similar stuff to what you're doing and who also knows where all the tools and materials are. Our first helper at the very beginning of the process was Doug. He found us a hammer drill for all those tapcons we put in the brick, on sale and in budget. That was the first of many, many times Doug was there to help with advice and direction. Framing issues, epoxy, railings, fittings, adhesives, faking historic trim, whatever. We must have used his skills dozens of times. And if Home Depot didn't have what we needed, he often knew just where to go. That's good service. He also directed us to two others who were instrumental in getting our floors figured out, and our walls painted. That's Walt in tool rental and Janet in paint. Hands-on experience lends you the confidence needed to work quickly. But our first and our go-to generalist is Doug. Seek him out.